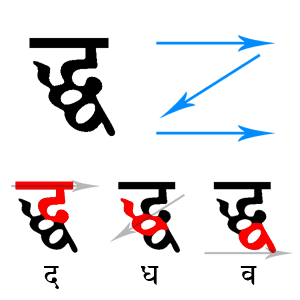 As you might remember, there are about 2,000 different verb roots in Sanskrit. For most sentences, these 2,000 verb roots are sufficient. But for more complex sentences, verbs often need to be more specific. Fortunately, Sanskrit gives us a way to create new verbs. We can use these verbs in the same way as the verbs we've studied so far. To create a verb, we attach a small term to the front of the verb root. Any sound that is attached to the front of a word is called a prefix, and the sounds we'll study now are called verb prefixes. There are about 20 different verb prefixes, and each has a special meaning. We can combine a prefix with a verb root to create a new and more complex idea. How do we use prefixes? Let's look at some examples. Below are some new verbs that are made from the root gam. Like a plain gam, each new verb has a general sense of moving or going. But, you can see that the prefixes make the verb much more specific. come together, assemble → They assemble. You go to meet (somebody). Other translations are "approach in order to assemble" or "go in order to meet." Note that both of these translations are quite long; sometimes, it can be easier and clearer to use a shorter expression, even if that shorter expression is less accurate. You approach together (with someone else). Although the examples here all clearly show the influence of the prefix on the verb's meaning, don't make the mistake of thinking that all prefixes always do so. In many situations, a prefix doesn't do much anything at all; in others, a prefix may act in an unexpected way. But, we can still say that prefixes generally behave as described above. You may have noticed that the m of sam changed to the anusvāra in front of the g of gam. Prefixes follow the normal rules of sandhi. If you've heard some Sanskrit words before, you've probably seen this prefix. It occurs in names like saṃjaya and terms like saṃsāra. It's also the sam in saṃskṛta, which is where the word "Sanskrit" comes from! In all three of these words, sam takes the meaning of "completely" or "absolutely." approached his master and spoke this word. Even though we haven't studied much Sanskrit, we know enough to understand many parts of this verse. dṛṣṭvā comes from darś, which is related to paśya and means "see." And what is seen? pāṇḍavānīka, which is in the object case. We can't be sure of what this word means, but it contains the word pāṇḍava, which you might recognize (click here if you don't). We see the word duryodhanaḥ, which changed to duryodhanas due to sandhi. Duryodhana is the name of a character in the Bhagavad Gita. From all of this, we can say that Duryodhana sees something related to the Pandavas. That's the first line; now, let's take a look at the second. We can guess that upasaṃgamya comes from upasaṃgam, meaning "approach." And what is being approached? acārya, which is in the object case. You might be familiar with this word already (click here if you aren't); it refers to a teacher or spiritual master. The rest of the line is difficult to understand, but rājā should look familiar (click here if it doesn't). This is a tricky noun. It seems as if the stem is rāja and the noun is in the case-1 plural, but it's actually from a different class of nouns altogether. We can't say how it refers to the rest of the verse, but since Duryodhana is a king, the word probably describes him. From all of this, we can say that Duryodhana, who is connected to the idea of "king" somehow, approaches a teacher. But then, having seen the army of the Pandavas arrayed, King Duryodhana approached his master and spoke this word. च and ज are easily confused. Notice that ज has a sharp point, almost if it were jabbing the letter next to it. Do you know how to read these combinations? The trick is to read these combinations in a Z pattern. Start in the upper-left and move right. Then, move down to the left. Finally, move right again to finish up. All conjunct consonants follow this pattern. Read the combination in a Z pattern. By doing so, you'll find that the combination is just ddhva. Likewise, the other combination is dbhra. Most computers do not have the files necessary to support these complex combinations. Perhaps that is a good thing. But you must remember that they still exist. Now that you know how to read them, they shouldn't give you much trouble.